King Farm Auto Service proudly serves the Washington metropolitan area including Northern Virginia, Rockville, Bethesda, Silver Spring, Giathersburg, and Germantown Maryland. We are also conveniently located close to the Shady Grove Metro Station. We specialize in HONDA/ACURA and TOYOTA/LEXUS repairs, but provide comprehensive auto repair services for all makes and models. King Farm Auto Service was started here in Rockville, MD in 1991 and has grown into one of the very finest auto repair and maintenance facilities in the area. Convenient Auto Repair is now also owned and operated by King Farm Auto Service. 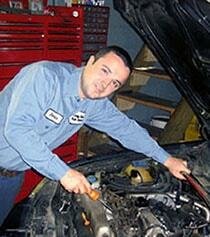 Customers of Convenient Auto Repair can expect the same great service and prices. We are committed to providing you with the highest quality professional repairs and service at a fair price. King Farm Auto Service offers a shuttle service to and from the Shady Grove metro station and your place of business within a 3 mile radius. We also offer a loaner car for auto services that take more than 2 hours. We specialize IN HONDA/ACURA and TOYOTA/LEXUS repairs, but we'll gladly accept any make and model in our shop! Your auto repair center in rockville! Our ASE certified mechanics deal directly with YOU and we explain repairs and options to resolve your vehicle's problems. We always provide an exact estimate before performing any repairs and keep you updated throughout the day if any changes need to be made. Most work can be done the same day - quickly and efficiently. Over 40 years of combined experience means our certified mechanics can solve any mechanical or electrical problem with your vehicle and get you back on the road in no time. We understand that sometimes vehicle repairs can be stressful so our friendly service staff will do everything possible to make you feel welcome, comfortable and satisfied with the service experience. If for any reason you are not satisfied with your service, please contact us. High quality service at fair prices. Much lower than dealership costs. Very reliable. Have been using King Farm Autoservice for 15 years. Honest, reliable and fair is the best description of the business. Would recommend to anyone in the area who is looking for an honest and experienced mechanic. Our family has been extremely pleased with quality of service here for nearly 15 years now. Highly recommended. Please contact us with any questions and we will respond promptly!